In his acceptance speech, Ambode linked his emergence to his mass appeal. I find that naive at best, laughable at the worst. Pray, in a genuine democratic environment, what mass appeal would someone with no political experience have over a popular serving senator in Ganiyu Solomon, over a long-term serving speaker of the state Assembly in Adeyemi Ikuforiji or over other politicians in the state like Leke Pitan and Tola Kasali? As predicted in the first part of this article, “King Tinebuchadnezzar’s” anointed candidate Akin Ambode won in the APC's selection called primaries organised in Lagos state on Thursday. I say selection because that’s exactly what it was despite the charade of trying to make it look like a fair primary election. The list of delegates to the election were not made known to other contestants except Ambode, neither was it a direct primary like was held in the old Alliance for Democracy (AD) in 1999 when Bola “Tinebuchadnezzar” Tinubu narrowly defeated in controversial circumstances the late Funsho Williams. In 1999, the primaries were held across the different wards in the 20 Local Governments (LGAs) in the state, while in this indirect primaries held on Thursday delegates were selected across the 20 LGAs and instructed on who the favoured candidate was hence the obvious selection of Ambode. It makes it easier for godfather Tinubu and his favourite Ambode, as the delegates were mostly APC LGA and state party executives drawn from the 20 LGAs and 37 LCDAs, state House of Assembly and National Assembly members representing the state and thus could not freely vote their choice as they could easily be dealt with politically if they do. 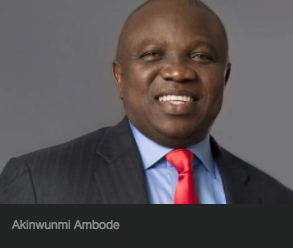 Furthermore on Wednesday, when the contestants met at the Airport Hotel in Ikeja with the APC Lagos state primary organising chairman Peter Obadan, Ambode made a Freudian slip to the rest of the candidates that they should accept the indirect primary option as they all know who the winner would be in any case. Ganiyu Solomon (GOS), a serving senator in the state and one of the contestants, insisted he explain to them all what he meant by such boastful statement, but Ambode denied right away he said so. It shows a bit of the character of the APC gubernatorial candidate Ambode, as someone who lacks tact, is proud, insensitive, sly and downright cheeky. If he wins in 2015, my judgement of his character tells me Lagosians would have a pro-elitist government, as someone who would be pro-masses would at least be more sensitive and tactful to his fellow contestants despite the undue leg-up he’s been given by his godfather ahead of other candidates. The travesty and tragedy in the comical race for the APC gubernatorial ticket in Lagos state is not the victory of Ambode, but the defeat for democracy and true progressive values in the state. The fact that the political space has been shut against many qualified and valuable politicians is the alarming danger in it all. There is no genuine politics going on in Lagos state except an empire built for the purpose of one king alone which is Tinubu. Here is how it works, if you are a politician with genuine mass appeal or grass-root following you would never get the godfather’s approval. The scam is to talk about electing a technocrat as governor who would not focus on politics while in office, ensuring you have no political structure or machinery to deploy for your political ambition. By the third year in office, should you have performed and begin to have any political following, the godfather instigates the state House of Assembly against you with the threat of impeachment which makes you reach out to him to save you. The agreement put forward to you is that you don’t build any political structure or machinery in the state and must use only the political machinery of the godfather, which ensures that while you may be popular for your performance in the state you have no true political structure on ground. This ensures that Tinubu emasculates the governor and the one person to be the major political force in the state thereby ensuring the continuity of his enterprise and slavery of Lagosians socio-politically. In his acceptance speech, Ambode linked his emergence to his mass appeal. I find that naive at best, laughable at the worst. Pray, in a genuine democratic environment, what mass appeal would someone with no political experience have over a popular serving senator in GOS, over a long-term serving speaker of the state Assembly in Adeyemi Ikuforiji or over other politicians in the state like Leke Pitan and Tola Kasali? He maybe happy now to use his godfather’s political machinery, resources and supposed clout but the same cycle would repeat itself first in three years’ time and later on in eight years’ time should he become governor of the state as long as the godfather is still alive. The political contraction goes all the way down to the House of Assembly nomination where for example in Ikeja Constituency 2 a seasoned female politician who has been with the party since 1999 and held various positions in the party and in the Local Government, was restricted in favour of Tinubu’s nephew Damola Kasumu who has no political experience. It was the same with the outgoing state legislator for that constituency Lola Akande (younger sister of Tinubu’s wife) who with no political engagement became a legislator for eight years. In Oshodi-Isolo constituency 2 Omowunmi-Edet was imposed in 2007 by Tinubu on the constituents and thus leaving out people with grass-root appeal. The whole scheme is run in such a way that you go away sequestered in Alausa in your legislative quarters and no engagement with your constituents (since you not from the grass-roots anyway), your only engagement would be with your godfather whose birthday, political rallies, daughters’ coronation as Iyaloja (Market-women leader) etc. you keep showing up for to keep you in his memory - should the direct imposition continue - but when the chips are down and it comes to primaries like it was done this time you can’t woo enough of your constituents to vote for you and its easy for Henry Ajomale’s (APC state chairman) son to defeat such returning legislator as they would be using the godfather’s machinery and the cycle gets repeated. Its like a never ending replicating virus Tinubu has planted in the political system in Lagos state that would ensure he alone determines everyone’s ambition and it’s only given to people with no political structure or machinery. Muiz Banire, a man not given to frivolous statements, some weeks back maintained that the APC may lose Lagos State and he openly criticised the role Tinubu is playing within the party. He was heavily criticised by some writers who stood in defence of their Emperor Nero, but they failed to see the ominous dangers. First it started with the Badagry division, who have always rejected the Tinubu imposition schemes since 2003 and opened the barn door for them to mostly vote for PDP, it crept to Ikorodu division through the likes of Adeseye Ogunlewe, then came the turn of Epe division with the Ibeju-Lekki axis opening their doors for PDP. Lagos division particularly Eti-Osa followed suit where Babajide Obanikoro won a council election on the opposition party’s platform but was denied at the tribunal. Ebute-Metta also under Lagos division had violent protest there when the incumbent legislator lost to a fresher. Those crying for a break-up of Nigeria (God forbid) should think carefully, say we have a Yoruba Nation is this the kind of politics we would be playing? A politics of servitude and glass-ceiling, where if you studied in the UK or US and your father is well known or you have a godfather then you can be allowed to get into public office. What about those who studied in Unilag, LASU, etc. or those who studied abroad and whose father are not known? It means in Tinubu’s republic you can’t contribute. When the likes of Obanikoro and Fayose fight for their independence and freedom we call them thugs and anti-progressives, but what exactly is progressive under Tinubu’s rule? When the people of Ekiti perform backward feats in their voting choice would it not be because they are fighting for independence and don’t want a Tinubu et al. style of politics were only the children of the rich and mighty, the elites get into public position especially in a state like Ekiti where though educated, lots of its indigenes are from humble/poor backgrounds. Compare the APC in Ondo State to that of Lagos, reports indicate that celebration broke out amongst youths in the state when primary results were announced with police having a hectic time curtailing the peaceful celebrations. Would that not be because Mimiko has delivered the state from Tinubu’s clutches and made it impossible for him to dictate candidates for the party in that state because that would have spelt doom for APC’s chances in the state? The youths were celebrating against Mimiko and PDP, but I tell you they should be thanking God instead for making it possible to elect their popular candidates unlike in Tinubu’s fiefdom in Lagos state. In Lagos State, PDP would need in the first instance to elect the right candidate. I would go for Jimi Agbaje for his level-headed and matured style almost similar to Fashola, but if Obanikoro gets the nod and removes violence from his campaign (with his thugs killing people indiscriminately at campaigns like it happened in 2007) then even he can defeat Ambode (Tinubu’s choice) come 2015. There is no Tinubu myth in Lagos or South-West its just the forces aligning in his favour in the past. The major bed-rock of APC in Lagos are the foot soldiers (both low-level, medium and high-level) once you deny the middle and high-level foot soldiers a chance to be part of the success they’ve all worked for in the state or at least give them a level-playing field to play politics and pursue their ambitions, then whilst they may not decamp from the party having being there since 1999, they are not be compelled to work for the party at the polls. They can either adopt passive resistance “siddon look” approach or an active resistance (which I prefer) and watch Tinubu, his nephews, family members, sons of his cronies and friends do the voters mobilisation and canvassing themselves and see how they win the state. PDP needs a candidate that would not run a campaign based on scaremongering, rumours, calumny, character assassination or violence but one based on facts, figures and evidences. This article would conclude in its final part on what PDP may capitalise on and needs to do to likely win the state in 2015. Ola’ Idowu is a management consultant and researcher and writes in from the UK. Contact him at frenchcoast2@gmail.com.